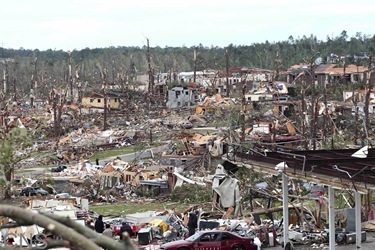 In your prayers, please continue to remember all those affected by the recent tornados in the Southeast, especially those who have been injured or killed. Extreme weather affects people in so many ways and, in many cases, even those who are not physically harmed have lost everything. This week, I released a statement on the situation that I want to share with you here. I have authorized a voluntary second collection to assist tornado relief efforts the weekend of May 28 and 29. Money received from the collection will be sent to the USCCB, which will in turn coordinate relief with Catholic Charities USA. If there is already has a second collection scheduled for that weekend, your parish may choose to accept donations directly over the next two weeks or make a donation directly from the parish. I urge you to be generous in supporting our brothers and sisters who have suffered so greatly. 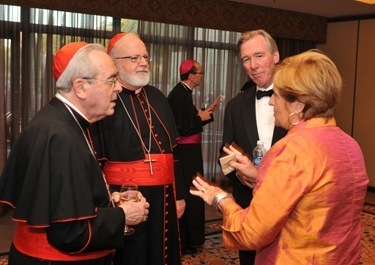 This past Friday I attended the 22nd annual American Cardinals Dinner, which benefits the Catholic University of America scholarship funds. 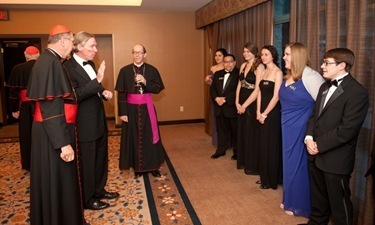 This year’s celebration was held at the Hyatt Regency in Scottsdale and was hosted by Bishop Thomas Olmsted, the bishop there. 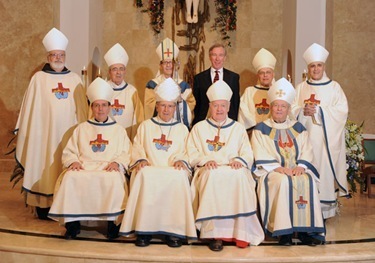 We were so pleased to be joined by Cardinals Mahony, Egan, Rigali, George and DiNardo as well as Archbishop Vigneron of Detroit, the chairman of the CUA board of directors, the nuncio, Archbishop Sambi and many members of the CUA board. 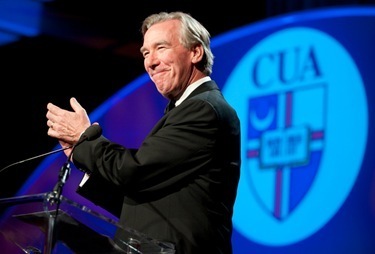 Of course, it was the first Catholic University dinner attended by John Garvey, the president of Catholic University inaugurated this past January. It was a very successful gathering, with almost 400 people in attendance. 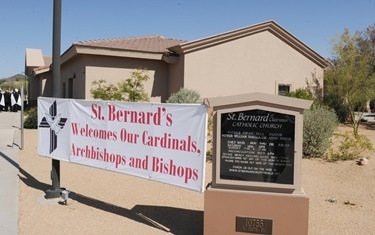 Prior to the dinner, we joined Bishop Olmsted for Mass at nearby St. Bernard of Clairvaux Church. Over the altar they have a very beautiful mosaics, which you can see in this photo. 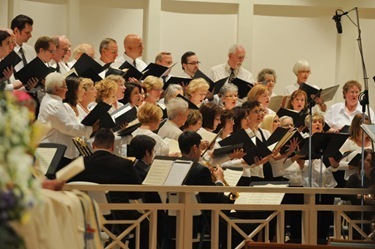 They had a wonderful choir and music program there. 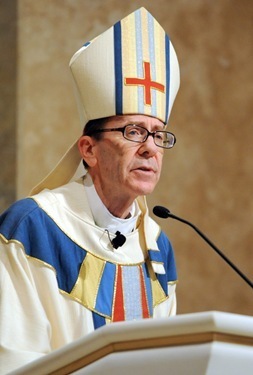 Bishop Olmsted gave a wonderful homily on the Catholic intellectual tradition , its importance in contemporary life and the important role Catholic University plays in society. 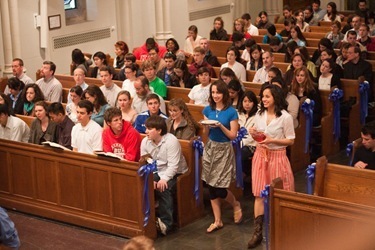 One of President Garvey’s priorities is increasing student recruitment in the southwestern United States, particularly among Hispanic Catholics. 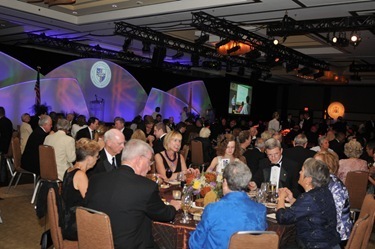 So, the dinner being in Phoenix was a great opportunity to highlight that and we hope more young Catholics in Arizona and the whole region will look at Catholic University when considering their college choices. Also at the dinner we had a chance to hear from Archbishop Sambi. In fact, we are very pleased that we will be welcoming Archbishop Sambi to Boston this weekend. 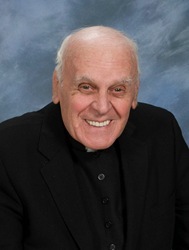 He will be in town Sunday to attend the annual gala for our Redemptoris Mater Seminary. 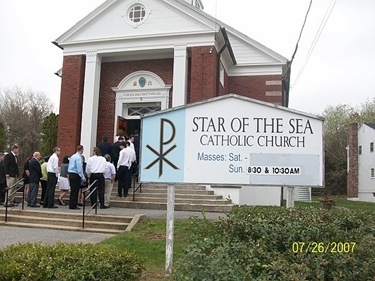 On Sunday, I had Confirmations at St. Mary Star of the Sea Parish in Salisbury. 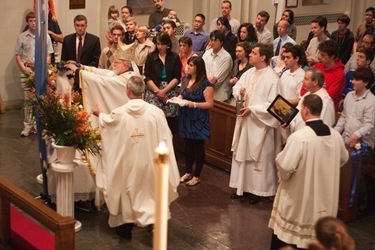 This was my first visit to the parish since I arrived here in Boston. The visit was a wonderful occasion, but it was particularly notable because their pastor of over 30 years, Father Thomas Morgan, died very suddenly on Friday. He was 81. He had retired in January for age and health reasons. It was an important chance to recognize his ministry over many years in the parish and personally express to the parish community my condolences on the sudden loss of their former pastor. Father Louis Palmieri is the pastor there now, as he graciously agreed to assume responsibilities for the parish in addition to his other assignment as pastor of Holy Name Parish in nearby Amesbury. 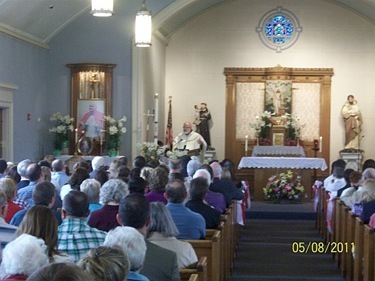 This year’s Confirmation class at the parish consisted of about 30 students and the Mass was attended by a standing-room-only crowd. It is always a great joy for me to be able to celebrate Confirmations in a parish, this moment when young people receive the great gift of the Holy Spirit. 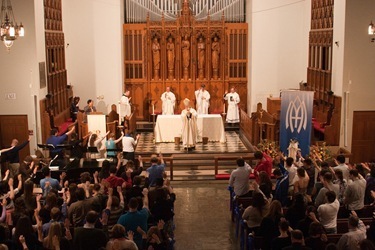 Sunday I was the main celebrant at the evening Mass at Boston University and had a wonderful visit with the students there. 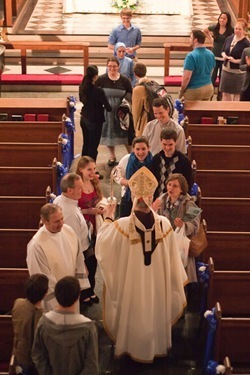 They have two Masses on Sunday evenings — at 6 o’clock and then at 10 o’clock. 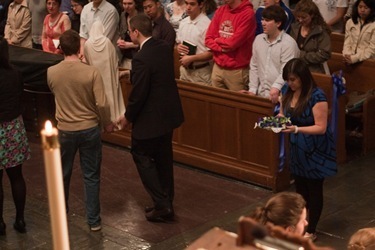 BU has one of the most vibrant campus ministries in the archdiocese. We have been blessed for many, many years with the tremendous support of the administration at Boston University. 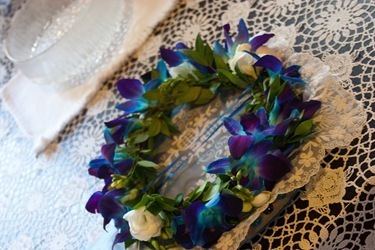 Sunday, as you know, was also Mother’s Day, and we honored our spiritual mother, Mary, with a May crowning near the end of Mass. 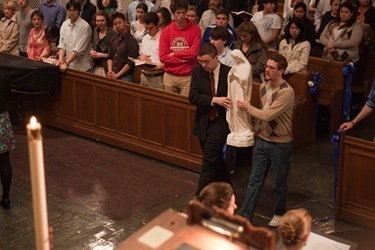 The students processed a statue of the Blessed Mother into the chapel where we had the crowning. I was so happy to see their evangelization efforts in practice — through the countless numbers of students they serve. 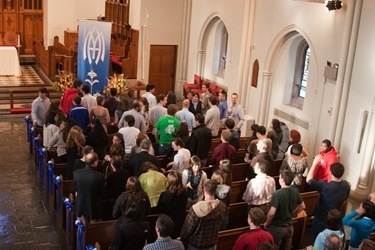 Some of these students may not have been fully engaged in the Church prior to coming to BU, but become more active through the campus ministry program. 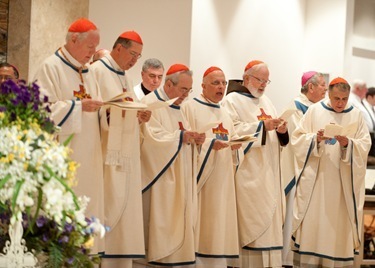 As always, the BU Catholic community is very upbeat, energetic, and gives me great hope for the future of this archdiocese. In addition to celebrating Mass with the students and having a chance to be present to them, the visit provided me the opportunity to publicly recognize the ministries of Sister Olga Yaqob and the Brotherhood of Hope at the campus. Both Sister Olga and the Brotherhood will be leaving BU this summer. Sister Olga will be discerning the founding of a new religious women’s order in the archdiocese and the Brotherhood will be working on a new campus ministry effort focusing on colleges in the Fenway area. 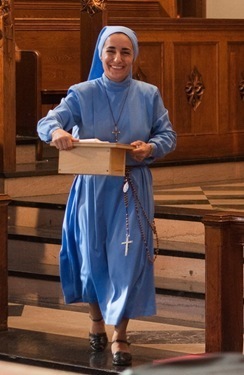 Sister Olga and the Brotherhood have been a wonderful presence at BU, and are well respected by the student community. We have been blessed by their presence and are grateful for all they have done there. 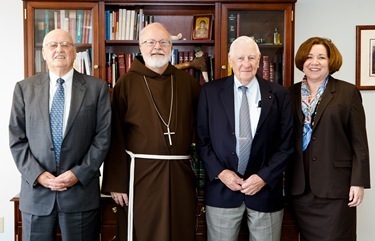 On Monday, our Superintendent of Schools Mary Grassa O’Neill and I met with Jack and Fred Sheehan to thank them for their service to Catholic education. Jack was an associate superintendent in our Catholic Schools Office before retiring in January. His brother, Fred, volunteers at St. Jerome School in Weymouth and is a very generous supporter of the school. Both Fred’s and Jack’s grandchildren attend the school, as well. 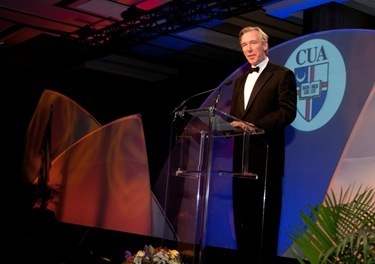 Fred was honored at a recent gala, but I was unable to join him for the occasion because I was out of town. So, I was happy to have this occasion to recognize both he and his brother for their service to our Catholic schools. 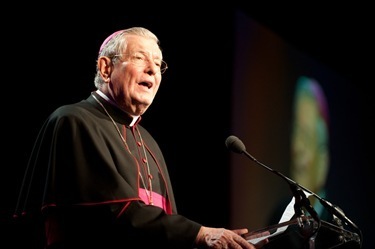 Finally, I want to conclude this week mentioning a conference we have coming up here in Boston, the annual meeting of the National Catholic Council on Alcoholism and Related Drug Problems. 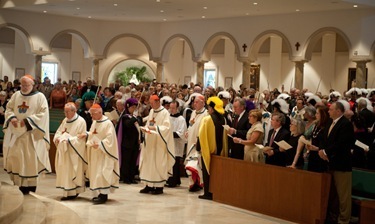 The organization is affiliated with the United States Conference of Catholic Bishops and is dedicated to educating the public on drug and alcohol related issues and the role the Church can play in assisting others, as well as helping Catholics, including the clergy, religious and lay people, secure the right kind of treatments. 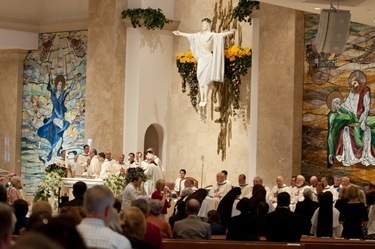 Their national conference will be held in Boston this year on July 11-13 and will explore how our Catholic spirituality can help people cope with addictions. Presentations will include the medical symptoms of addictions, how drug and alcohol addiction affects families, spirituality’s role in coping and how to establish addiction programs within the parishes. This is such an important issue these days, as so many people are dealing with the problems of drug and alcohol addiction. We are pleased to be able to welcome this group to Boston and we hope many local people will have a chance to benefit from the insight they provide.